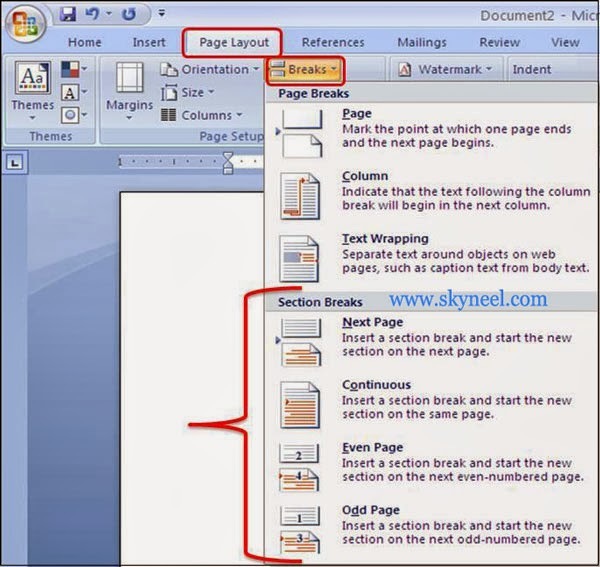 MS Word provides Section Breaks facility to modify the body structure of one or more pages, insert a break between different columns, separate the chapters page numbering and also create different header or footer with the help of section break in your active document. Section: It is a portion of active document in which you set some pages for formatting options. You can also create a new section, in which you want to change like line numbers, number of columns, or headers and footers. Section break: It gives you additional formatting options. A mark which you want to insert in active document to shows end of a section. A section breaks stores the formatting elements of a section just like margin setting, orientation of page, headers and footers, and sequence of page numbers. Types of Section Breaks: There are four types of section breaks used as per requirement in word. Next Page:It is used to starts the new section from the next page. Continuous: It is used to starts the new section on the same page. Odd and Even Page: Both options are used to starts the new section on the next odd or even numbered page. the Page Setup section >>> Select the desired section break option. Now section break appears at the insertion point. Click on View Tab >>> Click Draft Mode to view all kind of section breaks. Click on the Home tab >>> Click Show / Hide button in the Paragraph section (OR) Click View Tab >>> select Draft option in Document Views. Note: Remember one thing that a section break control the formatting of text with in a section. I hope you like this post. Give your important suggestion in comment box. Thanks.